Hi there and thanks for stopping by! It's been a busy day around here today and I'm finally finding the time to get this post up and running. There are about 2 hours left before this challenge is closed - so (lucky you) this one will be short and sweet! * I added some Martha Stewart Fine Glitter Paint to the furry part his hat, the icing on his arms and legs and the edges of the ornament. I had inked up the edges of his hat in red ink and it bled a bit when I applied the glitter. But, I think we will just call that "shading" and go with it....whatcha think? 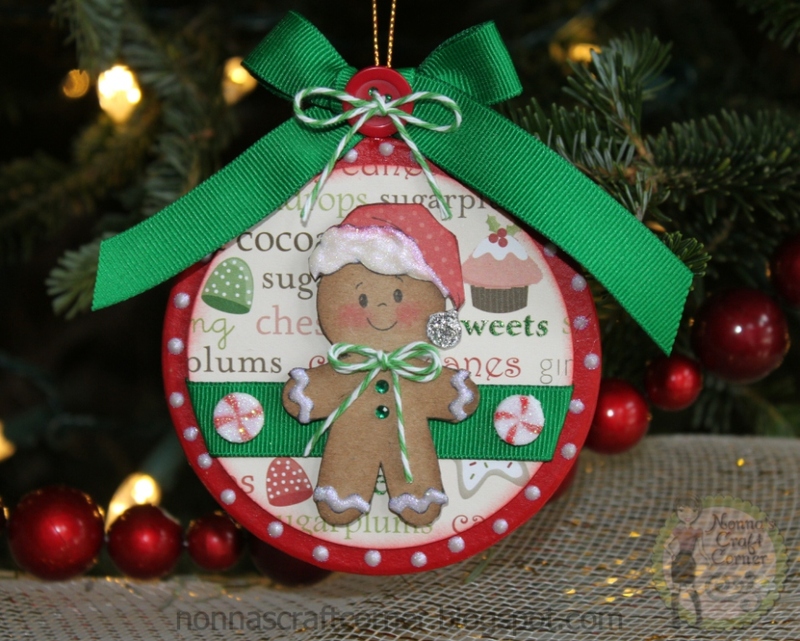 * I finished up with some cute twine, ribbon, button and gems from my stash of crafting goodies and added this cute little guy to my tree. Lola made sure that I placed our newest ornament in just the right place! Ok, I promised short and sweet - so I'm leaving now! Your ornament turned out great and I agree with Lola. I will have to pick up some of those paper mache ornaments. 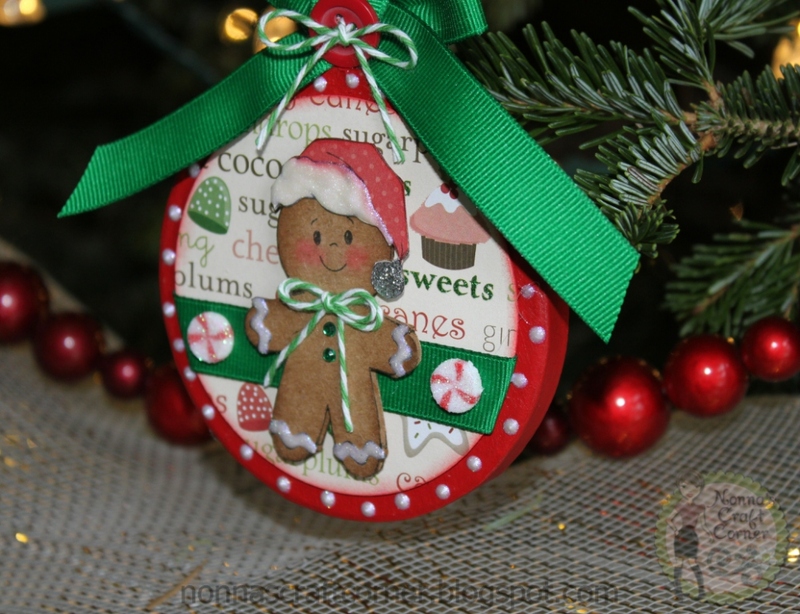 Always enjoy your projects, thanks so much for sharing at Peachy Keen's Ornament Challenge. Aaaw, what a cute ornament! I love the adorable face and your "shading" ha ha looks awesome! You did a fabulous job on your ornament. Can't believe your crafting with stitches in your finger girl....your amazing! Your little Lola is the cutest little pooch..such a sweetie! I love this ornament! You just helped me solve my problem for a gift I need for this weekend! Oh, as for the "shading"...yup, that's exactly what it is! It looks great! Hey, we could all use a bit of shading now and then. This is super cute. And Lola is a doll. Wow that is just 2 cute! What an adorable ornament!!! LOVE the cute cute gingerbread man....adorable!!! Super sweet! Looks good enough to eat, and a sweet little picture of your doggie, too! How totally cute is that?!?!?! LOVE this! So glad you joined us this week at Peachy Keen!!! This is adorable, Tanya! I love it! Thanks for playing along at Peachy Keen Stamps! Love your tag. Super cute lil doggie. Wow Tanya! Everything is just amazing! It always is, but so much fun to look through what you have been up to. No time for me... card making lately. Work has been just terrible. I will sure be glad for January to get here. Hee! Hee! Just wanted to stop by and visit! Big Hugs! For My Sweet Lil' Deer!